Boulder County is facing a boom in its aging population. According to the Boulder County Area Agency on Aging (BCAAA), Boulder County’s population is aging at one of the fastest rates in Colorado. With the senior population aging exponentially faster than younger populations, Boulder County struggles to meet seniors’ needs for nutrition, transportation, and engagement with the community. Our ongoing Safety Net Services fill these gaps by annually providing an average of 13,500 direct services. Ninety-five percent of seniors who provided income documentation and are enrolled in Cultivate’s services live near or below the poverty level. Our direct services provide them with free access to: 1) healthcare, through escorted rides to and from medical appointments; 2) nutrition, through the shopping and delivery of grocery orders; and 3) safety, through grab bar installation, simple home repairs, and seasonal yard and snow cleanup services. Our services are informed by the biennial Age Well report released by BCAAA. The Age Well report includes current information regarding demographics (the highest rate of growth in the senior population is those individuals age 80+), best practices in aging services, gaps in services, and recommendations from the aging community. We engage in continuous conversation with stakeholders including the individuals we serve, program volunteers, professionals in the field, and our organization’s funders while evaluating the effectiveness and necessity of our programs. We will continue to seek effective partnerships with other nonprofit organizations, corporations, and community organizations to expand our outreach without stretching our staff resources beyond capacity. In 2017, 85% of our clients reported feeling a greater sense of independence and social support as a result of our programs and volunteers. Cultivate’s goal is to increase our overall client base by 10% each year while maintaining these satisfaction levels and expanding our demographic and geographic reach. How collaboration worked: Cultivate builds relationships with local non-profits, organizations, and government agencies to raise awareness in the community. Additionally, we collaborate with other organizations in order to avoid duplication of services. The Medical Mobility program partners The Medical Mobility program partners with local transportation provider Via Mobility Services to provide accommodations which Via may not be able to meet, such as rides outside of Via’s service areas and rides to seniors who require or prefer to be escorted to their appointments. Similarly, Carry-Out Caravan has established partnerships with other community food agencies to ensure a streamlined referral system and easier access to affordable nutrition. Cultivate collaborates with numerous like-minded agencies and organizations which support seniors in the community, including: Boulder County; the Cities of Boulder, Longmont, and Lafayette; the Mayors of Boulder, Longmont, Lafayette and Lyons; the Boulder County Area Agency on Aging; the Boulder District Attorney; the Boulder County Sheriff’s Department; the Longmont Police Department; Boulder County Office of Emergency Management; the Elder Justice Coalition; and the Adult Protective Review Team. Cultivate is a supporting participant of the following: Boulder County Local Coordinating Council for transportation; the Aging Advisory Council; Folks in Aging; St. Vrain Community Council; Boulder InterAgency; Human Service Alliance; Community Preparedness Advisory Committee; and the Boulder County Latino Coalition. Cultivate also partners with local universities, senior centers, faith congregations, veteran facilities (VFW, Legion Post), community organizations, and for-profit organizations to recruit long-term volunteers and provide day-of-service projects for groups. Cultivate is funded through federal, state, local and private grants with additional revenue coming from individual and corporate donations. The process of project management, budgeting and funding is conducted in-house at the direction of the Executive Director and reviewed and supported by the Board of Directors. Annually, Board members participate in planning sessions to review outputs and outcomes for the previous year, evaluate the effectiveness of the programs and ensure the organizations goals align with the strategic plan. Monthly meetings are held to review financials, plan for the organization’s future, evaluate governance, and participate in resource development. A financial audit is conducted each year by an independent, third-party auditor to ensure that Cultivate’s finances are transparent and accurately reported. Details on older people's involvement: Cultivate runs on volunteers; all of our services are provided to seniors with the help of volunteers, and at Cultivate, seniors are not only clients, but also volunteers. Through our RSVP program we provide seniors 55+ the opportunity to be matched with meaningful volunteer experiences, both through Cultivate and through other community partners. Our updated survey was sent in February and will be followed up with phone calls and a second survey sent to non-respondents in May. We will continue to assess the effectiveness of the survey in order to make improvements as needed. Our first wave of respondents has indicated that they feel more independent, less isolated, and less lonely due to our services. Several respondents noted technology-based programs and socialization as areas that Cultivate has an opportunity to address. Qualitative data is collected through annual surveys to measure the impact that Cultivate programs are having on participants. We use this evaluative data to make program changes to better suit the needs of our participants. In 2017, we evaluated our current survey instrument in order to determine how to create consistency among questions to better track these measurable outcomes. Cultivate has learned that our services are needed everywhere, not just in Boulder County. Millions of seniors across the United States require support to both complete tasks and feel valued and engaged with their community. Cultivate is committed to helping all seniors flourish in every community. Initially, we are ensuring that our presence throughout Boulder County is as strong as it can be, and are currently recruiting volunteers and clients immediately outside of the county line so that we can begin to expand our programs. Throughout 2018, we will strategically evaluate the geographical areas where we can best live out this commitment. As Cultivate’s Safety Net Services are ongoing, we have the privilege of reviewing its effectiveness and creating yearly strategic plans to address the previous year’s challenges. In 2017, we learned of many “silent” populations who are afraid to reach out for help. 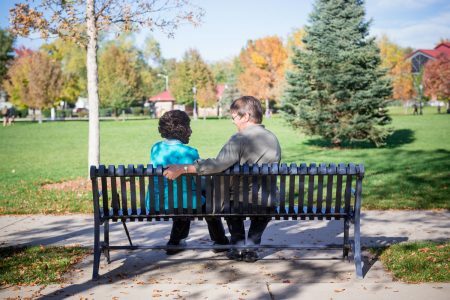 Seniors are an already vulnerable population, however, among seniors there are those who are part of other vulnerable populations, such as the Latino and LGBT communities. We made a commitment to reach these communities through inclusivity training to learn appropriate, targeted outreach. We want to ensure that our services are easily accessible for all seniors. In 2017, we hired three Spanish-bilingual staff members to improve outreach efforts into the Latino community as Cultural Brokers. They are currently working on translating all of our web and print materials into Spanish, and we are evaluating and updating all of our materials to ensure that the language is inclusive to the diverse population that we serve. Cultivate strives to create sustainable programs to serve current and future generations of seniors. As the senior population increases exponentially each year, the challenge that all senior service providers face is the capacity to meet the growing demand of requests. The major challenge for Cultivate is time and increased revenue. While the Board of Directors and staff would be thrilled with immediate growth, cultivating relationships for additional funding is a process that does not result in immediate return. However, in 2017, the Fundraising Committee, Executive Director and Outreach Manager significantly increased the amount of time spent engaging with supporters, donors and potential donors in the community, and this has resulted in new sources of income for Cultivate. We expect that the financial results of these relationships will continue to grow throughout 2018 and beyond.